My Aunt Bet was my daddy’s sister. She never married, never had children, never left home. That may or may not have been because of her Magnum P.I. mustache . . . .
All I know is she loved us — each one of her brothers, sisters, nieces and nephews. She’s been gone since 2012, and I still miss her so bad it hurts. She kept everything. And I mean everything. One day I convinced her to let me throw away sale papers from years past. I said, “Bet, come on. Those things aren’t on sale now. Matter of fact, I’m pretty sure they don’t even MAKE some of this stuff anymore.” She glared at me and reluctantly agreed to let me throw them away, along with some junk mail from 1997. After I left, my cousin John called me and said, “She’s outside going through the trash can, getting all those sale papers back out, fussing about you the whole time.” Sigh. There was nothing anyone could do. She was a hoarder, and she never changed. Although she kept a bunch of junk only important to her, she also kept things that are of value to those of us left behind. Treasures such as my Grandpa Bunton’s wallet, exactly the way he left it the day he died in 1973, and my Uncle Howard’s letters from Germany in WWII. I’m a sucker for sentiment, too. I’m not a hoarder, but I have some boxes of my kids’ things from when they were growing up. Report cards, stuffed animals, homemade Mother’s Day gifts. Lindsey’s beloved Big Bird from her Nanny. Kaitlyn’s Lee Middleton doll that looks like her. Daniel’s one last shred of the cloth diaper he used to hold when he sucked his thumb (only his right thumb. He never sucked his left thumb). The blankets their Grandma Bunton made them when they were born. Birthday cards from their great grandma Bare. Nothing in there means anything to anyone else but us. If my kids ever go through those boxes, I’m sure their minds will flood with memories at the sight of those things as well. They may actually even decide to keep some of it for themselves when I’m gone. However, there is one thing in those packed away boxes that only means something to me. You might think its gross, but here goes . . . I kept their bellybuttons when they fell off. Those little dried up pieces of their umbilical cords that looked like raisins? Yep, no lie — kept ’em in ziplock baggies. Why would I do that, you ask? Why would I save what is essentially a SCAB?! Because it was the one thing that belonged to both of us. It was my connection to them. It was how my body nourished their bodies. They don’t remember it. They didn’t even know I was there, holding them next to my heart, taking better care of them than I ever would the rest of their lives. I was never closer to them than when they were in my womb. No one but me would love them enough to save something no one else would possibly want! Let that sink in a minute . . . . He has a BOTTLE with YOUR NAME on it, and it has every tear you’ve ever cried. Every time you felt alone, like no one knew your private pain, God was and is keeping track of your broken heart. Every time you put on a happy face for the rest of the world, but inside you’re dying, God is writing it down in His book. It matters to Him. In my mind’s eye, I imagine a room in Heaven full of bottles. Each bottle has a different name on it. A bottle for all my tears, and a bottle for all your tears. Some bottles are more full than others. But they’re all there. None is lost. Why would God save our tears? No one else would care. Nobody in Heaven will ever pick up a bottle with loving memories — because they weren’t there to see each tear fall. Bottles of tears would never matter to anyone but the One who made you, the One who loves you the most. No one but God would love us enough to save something no one else would possibly want! He’s never closer to you than when your heart is broken. Even if you were oblivious to it, He was close. He was meeting all your needs, just like a baby in the womb is being fully and completely cared for by his mother. God was taking care of you when you needed it the most, even though you might not have known it. When our spirits are crushed, when we cry, when we are full of sorrow and anguish, God cares. He doesn’t turn a blind eye. He is close enough to catch every tear we’ve ever cried. And He saves them. In a bottle that belongs only to Him. You’re so loved, so incredibly special, that the God of the Universe keeps all your tears in a bottle. My extended family has always been very close. We cousins were raised more like siblings. We even called each other brother/cuz and sister/cuz. My cousins continue to mean the world to me. In March of 2010, my cousin Brad got sick. I mean, really, really sick. He was hospitalized with double pneumonia, blood clots in both pulmonary arteries and both legs. He had Acute Respiratory Distress Syndrome and a machine breathed for him for days and days. He was given less than a .00001% chance of survival. Seven times they called in the family to say goodbye. Seven times he shocked the world and survived. My cousin Steve suggested I start writing a CaringBridge about Brad because I was having a hard time keeping family and friends informed of his condition. I agreed because I knew we needed people praying. The only hope Brad had was for God to do a miracle. Even Brad’s doctors say he is a miracle. He is not unscathed. He continues to deal with the aftermath of that trauma, but he is still with us, and I’m eternally grateful! I love you, Bradley Reid! During those intense months, I burned up the road in between Lynchburg and Moses Cone Hospital in Greensboro to stand vigil by his bed, sit with my family, or to say a heartbroken goodbye when we thought he was going to die. Life was all about Brad for my family during those months. That was okay with me because I was already in the autopilot mode anyway. I had learned to just think about my kids every day, and nothing much else, to simply put one foot in front of the other. At one time I begged God to rescue me, and He had moved me into a place of quiet existence. I wasn’t thriving, but I wasn’t dying. Treading water felt so much better than drowning that I didn’t ask for more. People were emailing me constantly about Brad, many complete strangers, telling me how they were praying for him, and how amazed they were at God’s healing hand. One day, however, I got one that wasn’t about Brad. It was about me. Karen was a friend to both me and Brad, and she said when she was praying, the Holy Spirit told her He wasn’t just healing Brad, He was healing me. I was floored. Healing me? I thought I’d been healed all I was going to be. I wasn’t filled with anxiety every day anymore. Wasn’t that enough? It wasn’t much, but it was dang sure better than the Valley of the Shadow of Death! You see, I thought I was unworthy of being truly happy. Life abundant was something I used to want, but I was now disqualified. I thought I was finished with teaching, helping people, and ministry in general. The call I once felt was lost to me. I accepted that I was now useless to the kingdom. My life had ended badly. How could I be of any real service? I didn’t realize it was a lie from Satan. As I continued to write Brad’s CaringBridge, God began to give me words to encourage people. I went from just updating about Brad’s condition to making Biblical application and actually teaching again. No, I didn’t have a Sunday School audience anymore, but I had an internet audience. And I decided to be faithful to that. Ezekiel said, “Only You know, Lord.” God told Ezekiel to speak to the dry bones, and they would live. Ezekiel spoke, and God brought new life to the dry bones, muscles and tendons. Once dead bones lived again by the spoken word. Folks, the power of life and death are in your words. Be VERY careful how you use them. Karen was faithful to speak life into my dry bones. I’m alive again, and I didn’t realize I was still dead! Look around you. You are surrounded by dead bones. I say to you, SPEAK LIFE every chance you get! Friend, your life isn’t over. You can be a blessing to everyone around you. God isn’t finished with you! I’m 100% sure of that, and you know how I know? Because there is still breath in your lungs. As long as you’re alive, you’re still useful to the kingdom of God. Take that gift and pass it on. Speak life to someone else today. You will never know the ripple effect of that one kind gesture this side of eternity! When Brad is well and at home you must continue to write- it is a blessing and many of us are encouraged and brought closer in our daily walk through your devotions. Well Karen, it’s only taken me five years, but better late than never. Thank you for speaking life to these dry bones. Please excuse my hiatus from writing. No, I haven’t run out of things to say — if you know me, you know that will NEVER happen! We just returned from 9 days in Alaska. I suppose many are surprised I’d want to go back when they know I had some hard times there. I had many good times there as well, I just haven’t written about them yet, and my daughter and son in law live there now! Throw in the fact that I loved Alaskan summers, I miss Lindsey and Dan terribly, Todd and his parents (Mike and Sue) had never been, we had a free place to stay, free airline tickets (thank you, Amex points! ), and you got a recipe for a wonderful vacation! 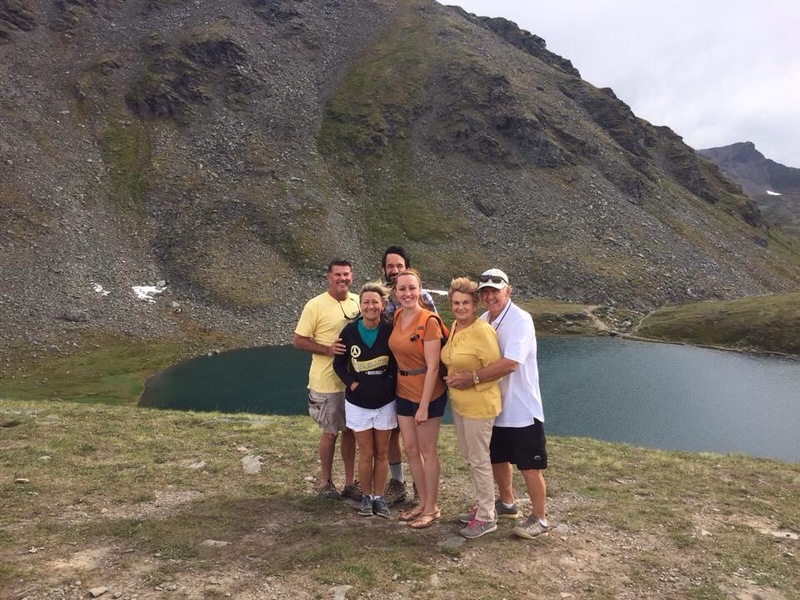 There is a place called Hatcher Pass not far from Dan and Lindsey’s house. It’s their favorite place to hike, so off we went, driving and climbing up a steep 3500 feet. (We pretty much tried to keep up with Todd’s parents on every hike — they left us in their dust!) 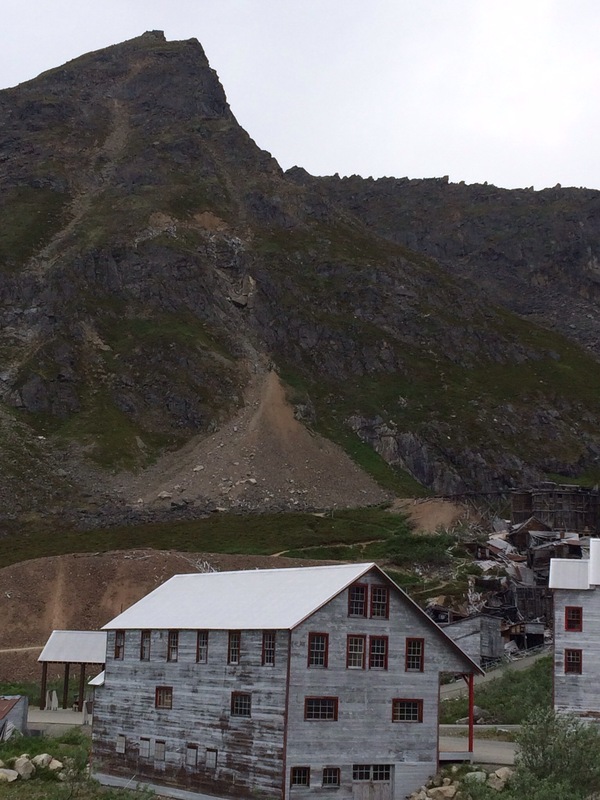 Near the top of the mountain, there is an old gold mining camp from the 1930’s called Independence Mine. The views were majestic! We walked around, imagining what the little town was like when you could hear the constant crashing of rocks as the gold was mined from the depths of the mountain. We didn’t get to look at everything as much as we wanted, so on our last morning, Todd, Mike and I went back. Only this day was quite different. 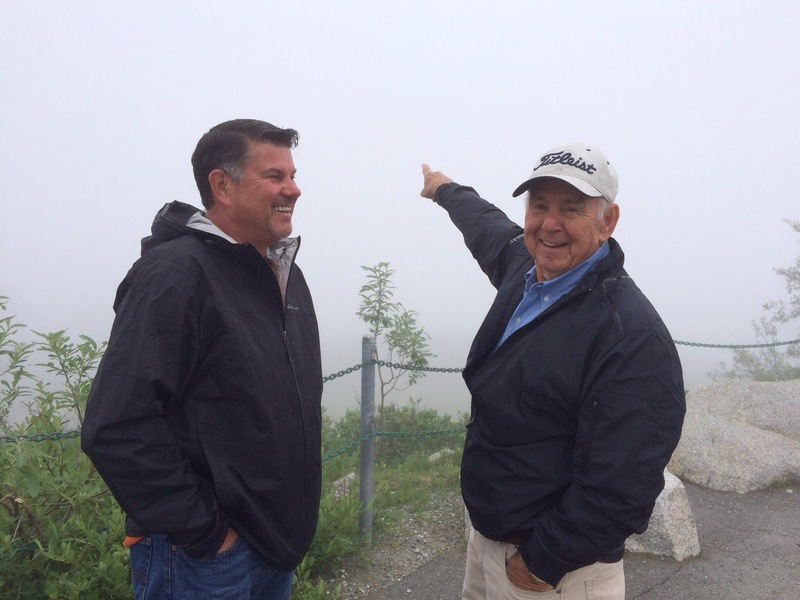 A heavy, dense fog covered the mountains. It was 45 degrees — so cold we could see our breath! But we pressed on to look at the historical buildings we’d missed last time, reading about the life of an Alaska gold mine circa pre-WWII. We could see the buildings when we got close to them, but we couldn’t see even one mountain. Not one valley. Not one river. Not one snow capped peak. But we knew they were there . . . . not a doubt in our minds. We knew that through the dense fog, through those heavy clouds, there stood the Talkeetna Mountain Range. There was no chance it wasn’t there. No possibility it had evaporated, moved, took off or left town. If we’d stumbled upon this abandoned mine on zero visability July 9, we would never have known what wonders were behind those clouds. But thankfully, we’d been there on warm, sunny July 6 and had seen the Mat-Su Valley in all its glory. It lurked past our vision — in things unseen. No human power on earth could have convinced us those mountains weren’t there. We had faith because we’d seen with our own eyes in brighter days. During yet another difficult season of my life (there have been quite a few! ), a wise pastor told me, “Don’t question in the dark what God showed you in the light.” I was having a hard time holding on to God’s word, to His promise that He had a plan for my life, and that it was a plan for my good, for my success. I was looking at the daunting circumstances right in front of me, instead of trusting that there is a God whose nature is to love me. I needed someone to remind me what I see in front of me isn’t all there is! Hang on, keep walking, don’t give up. There are all sorts of majestic things just beyond what is right in front of you. Preach the gospel to yourself daily, and remind yourself that though life is filled with shifting sand, there is a mountain that cannot be moved, just beyond the fog, the evidence of things not seen.